Input : 240V ±10%, AC, 50/60Hz. 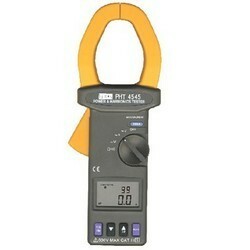 Digital Timer: 4 digit, solid state, time interval measuring system, 5 ranges from .0001 to 9999 seconds. Timer Control Circuits : Timer automatically starts when output is initiated and automatically stops when the device.under test operates. Test Conditions : Normally open contacts (potential free) / Normally closed contacts (potential free). Auto cut-off: Cuts off output on operation of device under test. Duty cycle : 10 mins ON / 15 mins OFF. Metering : Digital LED volt and amp meters. Accuracy: ± 1% ± 3 digits. Operation : A SET/ TEST switch is provided so that the appropriate test current can be set up before the test is actually carried out, and to avoid damage to relay coils by disconnecting the test current after the relay has operated. Construction : Sheet metal cabinet powder coated with cover and lifting handles. Test leads-2 metre long and operating manual. Each of these outputs has a separate terminal referred toone common terminal. Each of these outputs has a separate pair of terminals. Each of these outputs has a separate terminal referred to one common terminal. Voltage. . . . . Separate meters for AC and DC outputs 300V. Q.C. testing and maintenance of the entire plant. Battery Type 9V, Eveready type 216 or eq. 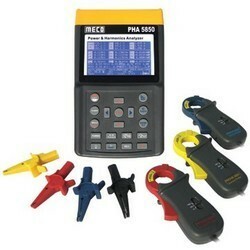 We are one of the leading exporters and traders of Harmonic Analyzer in India. Our Harmonic Analyzer is a handy, versatile power, energy and harmonics analyzer that sharply enhances the quality of information and decision making for the knowledgeable electrical engineer. Its small size, quick connections and its ability to provide a wide range of data makes it an extremely useful tool for load studies and trouble shooting in the field. 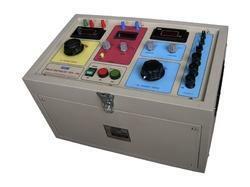 Looking for Power Harmonics Tester ?